Archibald Centre is named after Brigadier W.P. Archibald who was the First Parole Officer in Canada in the early 1900s. Based upon over 100 years of proven experience the Archibald Centre is an 18 Bed Community Residential Facility (CRF), operated by The Salvation Army. The Archibald Centre serves and supports Communities of Ontario with services that assist men and their families while improving Public Safety through a Cooperative Case Management System. We partner with The Correctional Services of Canada and The Toronto Police Services along with input and support from our local Municipality and Neighborhood Associations.As a co-managed facility with Bunton Lodge located in the heart of the Old Mansion District, the Archibald Centre affords opportunities for employment, housing, and enrollment in Community programs for men approved by the Parole Board of Canada to serving periods of Community Supervision under a Cooperative Case Management System. Counseling along with essential goal planning, approved community access and limitations, job readiness, housing assistance and a review and monitoring of conditions as determined by the Parole Board of Canada are provided at Archibald Centre. In addition, we ensure that local community recommendations are made through our Community Assessment Team to ensure a value added service to the residents while exercising strong public safety protocols. The Salvation Army is a leader in Community Reintegration and Public Safety. "Giving Hope Today" we provide in excess of 100 years of trusted experience in Community Correctional and Parole Services in Canada. Our Community Residential Facilities Staff have designed and deliver programs that demonstrate increased success rates in reintegration while offering the hope for men and their families that they need at the time of release and afterwards. The Victim Impact Program (VIP) is currently available for residents who have been screened for acceptance with a recommendation to attend this program or through a referral. This 10 session group program helps to further the knowledge of how past criminal actions and values have an impact on the victims of their crimes with a focus on crime prevention through victim empathy and acknowledgement. The Emotions Management and Violence Prevention Program (EMVP) is also offered on-site as a ten week continuous curriculum delivered at our CRF locations. The EMVP is held one evening per week in our Community Resource Rooms. The program focus is to re-evaluate, learn new and build upon skills acquired during the Correctional Plan now that the participant is back in the community. These In-House Programs and all other programs can be recommended by our Local Community Assessment Team, Case Management Team or by the Parole Board of Canada. The Employment Readiness Program is a multi step approach to re-engaging employers with a modern resume, interview skills and dressing for success. 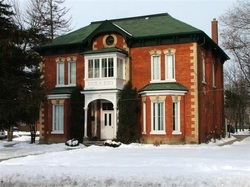 Bunton Lodge is a 43 Bed Community Residential Facility (CRF), operated by The Salvation Army, serving Communities of Ontario with services and supports that assist men and their families while improving Public Safety. Our Cooperative Case Management System working closely with The Correctional Services of Canada and The Toronto Police Services has been acclaimed for its best practices and policies and procedures. As a co-managed facility with the W.P. 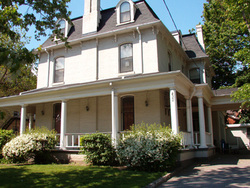 Archibald Centre located in the heart of the Old Mansion District, Bunton Lodge affords opportunities for employment, housing, and enrollment in Community programs. The men we serve and support are approved by the Parole Board of Canada to serve a period of Community Supervision under our Cooperative Case Management System. Counseling along with essential goal planning, approved community access and limitations, job readiness, housing assistance and a review and monitoring of conditions as determined by the Parole Board of Canada are provided at Bunton Lodge. In addition, we ensure that local community recommendations are made through our Community Assessment Teams to ensure a value added service to the residents while exercising strong public safety protocols. The Employment Readiness Program is a multi-step approach to re-engaging employers with a modern resume, interview skills and dressing for success. These programs and others including: Book club, Bible Study and Games Night (for present and past residents) make our CRF relevant based upon evidence-based results! Our newest Community Residential Facility is located in our brand-new multi-purpose building on the corner of Shuter and Jarvis Street Toronto. This location is universally accessible and close to the downtown core and subway system. on Addictions Management and Prevention. With 26 beds on 2 floors of our Multi-purpose building we are able to offer a variety of services ranging from Addictions Counseling and Programs to English Language training and Chaplain Spiritual Counseling Services. The Harbour Light Community Residential Facility provides a program of community accountability for all our residents under conditional release as per the Parole Board of Canada. In addition, our program is especially geared towards assisting men to remain drug and alcohol free while in the community. Referrals and access to the full Harbour Light addictions program on-site is available working in full collaboration with our Case Management Team. In addition to the onsite addictions program, our Community Residential Facilities Staff have designed and deliver programs that demonstrate increased success rates in reintegration while offering the hope for men and their families that they need at the time of release and afterwards. These programs and others including: Bookclub, Bible Study and Games Night (for present and past residents) make our CRF relevant based upon evidence-based results! Applications are available through our Assistant Annette Russell annettek@on.aibn.com and all Ontario Federal Institutions. The Salvation Army Cuthbert House provide residential and community based services to young persons who are involved in the youth justice system. Cuthbert House help young persons to be successfully rehabilitated and reintegrated back into the community. ​These open custody / detention facilities hold youth between the ages of 12 and 17 who either are serving a custody sentence or being held in detention awaiting disposition of their charges by the courts. Youth are placed in the residence by Youth Justice officials.